Maintain a Combination of Growth and Value Mutual Funds — More Than Your Money Inc. Diversification is a key element to successful investing. Stock portfolios should be diversified into large, medium, and small companies, in different industries, located in the United States and around the world. The easiest way to diversify your portfolio is with mutual funds where your funds are pooled together with funds from other investors to buy a wide variety of different companies. In addition to company size, industry, and geography, mutual funds also enable you to diversify into an appropriate mix of growth, value and blended investment styles. Growth and value funds invest in companies of all sizes both domestically and internationally. Growth funds usually invest in companies that have strong earnings momentum and are expected to grow faster than the overall market. Growth stocks generally expect higher profit margins with the potential for higher returns. They have a higher price in relation to current earnings due to the anticipation of future growth opportunities. Growth stocks are also more likely to invest profits back into the company for future expansion rather than pay dividends. Growth stocks tend to be more volatile than value stocks. They increase more when the market is rising and drop more when the market is falling. Growth stocks will generally outperform during market rallies and value stocks will perform better in bear markets. The industries where you will typically find growth stocks include technology, health care and discretionary consumer goods. Value stocks are generally undervalued and are purchased with the hope that share prices will increase up to the stock’s fair value. Value stocks usually have lower than average sales and earnings growth and lower prices in relation to earnings. The stock may be low due to a slump in the industry or a poor earnings report that may not be indicative of long term potential. Undervalued stock can offer tremendous opportunities for long term appreciation but there‘s a risk that the stock price won’t rise. Many value stocks are in mature industries where they are more likely to pay dividends than reinvest earnings. Unlike growth stock where most of the return comes from price appreciation, the total return on value stocks may include price appreciation and dividend income. Value stocks are less volatile than growth stock and usually offer more protection during market sell offs. Industries that typically represent value stocks include finance, energy, utilities and consumer staples. 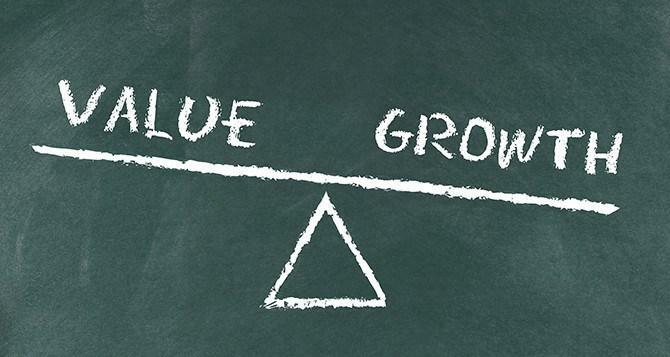 There is no need to choose between growth and value. A well diversified portfolio should contain a good balance of growth and value stock mutual funds or blended funds, which are a combination of growth and value. Growth and value funds perform well at different times in different market conditions, so they tend to counterbalance one another. Since it is impossible to effectively time the market, a combination of growth stock funds and value stock funds allows you to be better prepared for any situation the market presents.